TBanister: Thank you so much for having me, Ana! I’m excited to be here. TBanister: Like my favorite fictional heroine, Scarlett O'Hara, I am a Southern belle who lives on the outskirts of Atlanta. I'm addicted to television (I watch everything from Disney shows to Top Chef and think the DVR is the best invention since the wheel. ), crossword puzzles (I do 3-5 a day and like to time myself. ), and salt and vinegar potato chips (My one junk food weakness.) Animal rights (I have three rescue dogs, two with special needs.) and finding a cure for diabetes (I've been a Type 1 diabetic for over 25 years.) are my two passions. I love theater and try to get to New York to see several Broadway shows every year. And, of course, I am a rabid reader who enjoys a wide variety of genres, everything from Historical Romance to Steampunk. TBanister: I was obsessed with The Jungle Book by Rudyard Kipling when I was little. It was the book I wanted to be read to me every night, and I had every word memorized so my mother couldn’t skip a page without me calling her out on it! TBanister: I think it was just books in general. I loved reading from a very young age and I was never happier than when I was in a library. I started writing my own stories when I was in elementary school, and my love of putting pen to paper (or fingers to keyboard) just grew from there. Ana: Is there anything you want to say to aspiring writers? TBanister: Focus on being the best writer you can be and don't rush to publish the first thing you write. Read as many different books in as many different genres as you can. Take the time to learn and grow as a writer. You’ll know when you've written the book that's "the one," then you can educate yourself on the different publishing avenues and decide what's best for you. Ana: I absolutely loved In Need of Therapy, but let’s pretend I have no idea what it’s about, can you tell us a little bit about it? TBanister: Thanks, Ana! I’m so glad you enjoyed the book. Okay, in a nutshell . . . In Need of Therapy is a fun, fizzy read about a Latina psychologist who struggles to cope with all the craziness in her life, which comes in the forms of her high-strung family, her demanding patients, and a trio of potential love interests, all of whom are Mr. Wrong. Ana: I loved Pilar’s patients and their problems. And some of their problems were pretty out there, are you a therapist in disguise or did you have a hunky doctor at your beck and call? TBanister: I wish I knew a hunky doctor, but alas I do not. I did toy with the idea of becoming a psychologist when I was in school and even took several courses on the subject so that’s where some of my info on the therapeutic process came from. Also, I picked the brains of friends and family members who’d been to see a shrink and I did plenty of research into different psychological conditions. Ana: What was the hardest part about writing In Need of Therapy? TBanister: Honestly, I can’t think of anything that was too difficult about writing Therapy. I had a blast with the characters, the story, and the setting. It was the first book I wrote using a first-person POV, so that might have taken me a little time to get used to, but I love a writing challenge! TBanister: My current work-in-progress is a Chick Lit novel about two sisters who are polar opposites and live in San Francisco. I can't say anything more without getting spoilery, but I can promise plenty of comedy, romance, cute guys, and even cuter dogs. This one should be released in the fall of 2013. I am, also, hoping to write a Regency Era series that will have the same comedic and romantic elements that my modern-day novels do. I've already got several chapters of the first book in the series under my belt and I look forward to moving forward with it as soon as I'm done with my San Francisco story! TBanister: Sadly, no, since I live in a landlocked area. That’s probably why I decided to set In Need of Therapy in Miami; I got to transport myself to the beach every day when I was writing the book! TBanister: It was great to hang out here on the virtual beach with you, Ana! 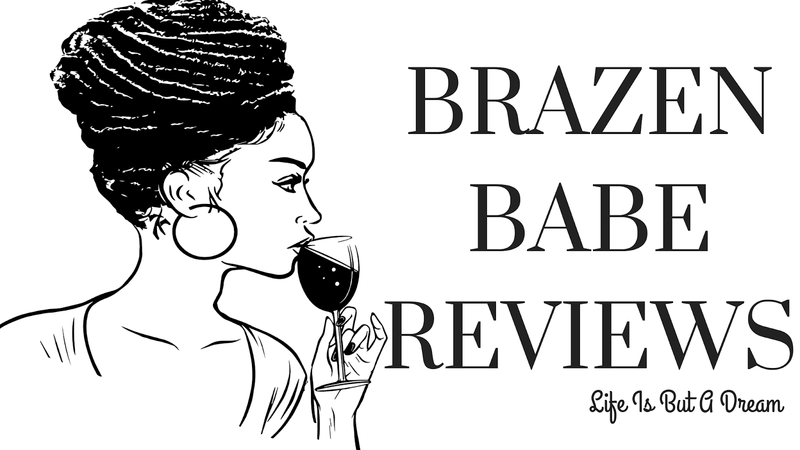 Thanks again for reading and reviewing In Need of Therapy! TBanister: I’m a True Blood addict, so vampires all the way. Zombies freak me out! TBanister: I love a good cheeseburger, but not beef – turkey or bison! 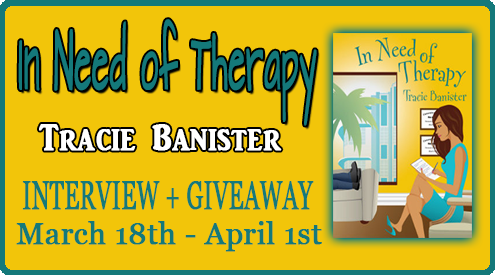 Concluding our little chat, Tracie is giving away an eBook copy of In Need of Therapy! 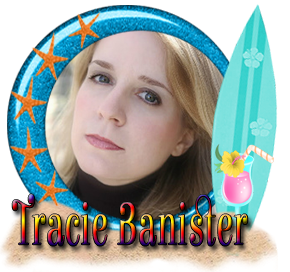 An avid reader and writer, Tracie Banister has been scribbling stories since she was a child, most of them featuring feisty heroines with complicated love lives like her favorite fictional protagonist Scarlett O'Hara. Her work was first seen on the stage of her elementary school, where her 4th grade class performed an original holiday play that she penned (Like all good divas-in-the-making, she, also, starred in and tried to direct the production.) Her dreams of authorial success were put on the backburner when she reached adulthood and discovered that she needed a "real" job in order to pay her bills. Her career as personal assistant to a local entrepreneur lasted for 12 years. When it ended, Tracie decided to follow her bliss and dedicate herself to writing full-time. Her debut novel, the Hollywood-themed BLAME IT ON THE FAME, was released in January, 2012. And she's following that up with the Miami-set Romantic Comedy, IN NEED OF THERAPY. Tracie, I can totally relate on the whole calling your parent(s) out on skipping pages while reading a bed time story haha. I had the same thing, but with a different book. Can't wait to read In Need of Therapy! Thanks for the giveaway. Your book sounds like a really good book..Thanks for the chance to win..